Boyd: Well, Mr. Dayvs, how did you get interested in jazz? Dayvs: Wow! That came about long, many, many, moons ago. I guess I was about 14 years old and I just noticed something about the music that appealed to me. I lived in a little duplex and this guy named Sonny, that lived next door played jazz music all the time. The person who captured my attention was Jimmy Smith. I could hear that bass line. That’s all I could hear, that bass line. Boyd: He carried his own bass line? Sonny let me listen to it. And from that point on I just got in to it and gave away all of my R & B music. Then someone gave me two jazz albums by Miles Davis and Jimmy Smith. Boyd: Two of the greatest. Dayvs: Yeah, that’s how it started for me. Boyd: What did you do after that? Did you play music in school? Dayvs: Well, nope. I’m what you call a natural percussionist, because I never got any lessons or anything really. I play the congas and even a bunch of years before I got into that I would beat on pots and pans for a long time, beat on anything. Boyd: Well now you have a TV show that comes on Channel 2B on Thursdays in Campbell, Cupertino and San Jose. From what I have seen, it is a very good show. You have some very good tapes. It’s too bad we don’t have more of that kind of exposure of Jazz to the public at large and I am all for expanding it more. You also have a radio show, don’t you? Dayvs: Yeah. That’s with a little radio station in Cupertino. It’s a community radio station. Boyd: How often do you do that? Dayvs: Once a week. A two-or-three hour show every Monday. Boyd: do you also do interviews? Dayvs: No. This show is on so early in the morning. I’m on from 3 to 6 a.m. so this gives me an opportunity to stretch out and play some music. Boyd: What station is it? Dayvs: KKEP 91.5 F.M. You can hear it over most of the San Francisco Bay Area. I’ve heard it in Oakland, parts of San Francisco, and you can hear it real well in Monterey. Boyd: Do you record these beforehand or do you just go online? Dayvs: I just go online with the radio show. Boyd: If I could get you someone to interview live that time of morning would you be interested? Dayvs: Oh, absolutely. Sure. If someone wants to wake up that time of morning, definitely. Boyd: I see your heart is in the organ. And from the tapes I’ve heard and from looking at that organ over in the corner, how did you choose the organ? Dayvs: That’s a B3. Well, it started with Jimmy Smith and you asked me about music and I forgot this. When I was a senior in high school I finally got an organ and I took some lessons and eventually it became a choice between the organ and the ladies. Boyd: I know the feeling. I remember playing in the school band and when I was on the dance floor I wanted to be on stage playing with the band; when I was on stage, I wanted to be on the dance floor with the girls. How did you get your start on radio? Dayvs: Leslie Knight does a jazz show on KCSM. I met Leslie at Kimball’s Club in San Francisco. I was there with Jimmy McGriff, who happens to be a very good friend of mine. She asked me to introduce her to Jimmy McGriff and I did . We started talking and she arranged for me to come on her show and train with her. I learned very quickly. I understand quicker than it usually happens and soon I had my own show. Boyd: Did you have to get a FCC license or anything like that? Dayvs: Well, I already had that because I was into radio professionally for five years in Tulsa, Oklahoma. Actually, I was stepping back into an arena I had already been in for five years. Boyd: What kind of show did you have in Oklahoma? Dayvs: R & B. It was a mixture of everything and I did a Jazz show on Sundays. Boyd: Well, you were familiar with radio. How about TV? Is this your first? Dayvs: Yes, very first. It was kind of a fluke. Another friend of mine, Queen Ann Cannon, had a community show. She had had it for several years and she asked me to guest host her show and I did. I got interested and asked her what I needed to do to get a show of my own. She said, “Put your name on a list.” It took two years and once my name came up, I actually was given a time slot. Then it took me another year to get myself prepared. After some procrastination, I finally got a show on the air. I produced one show and from that I partitioned six manjor record companies’ video departments and everyone responded. Now, like MTV, I am serviced by the record companies; e.g., Columbia, Capital, Arista, Bluenote and others. Anything they send me in Jazz I’ll do. I also do a little new age and blues. Boyd: What do you think about Fusion? Dayvs: I like some of it, my preference is straight ahead bebop. I like Jazz main stream. Fusion is OK but it gets a little redundant. I guess all music does for that matter. It’s not as palatable to me (Fusion). Boyd: I feel the same way. Fusion turns me off. When I was in art school the teacher said you don’t mix two mediums. When you play fusion you mix several mediums and it doesn’t always come out too good, in my opinion. Dayvs: I like Jimmy Smith’s term. He calls it Confusion – Laughter. The thing I like about fusion is that by listening to it, people are indirectly being exposed to jazz. Take someone like Chic Corea who can step across the line and can go in either direction. Take George Benson. There are a lot of people who know how to do it. And when you go to see them you are going to hear some mainstream. That’s what I like about it. There are musicians who are fusion through and through and they can’t make that transition from mainstream to fusion back and forth. Boyd: A lot of people can play technical Jazz as it is written, but they can’t add or take away anything to enhance the music. Dayvs: I am real ecstatic when I hear youngsters like the Harper Brothers and the Marsalis family who have stayed with the tradition. This young kid on the B3 organ, Joey DeFrancisco, plays bebop note for note. I mean he is killing on that organ. Man, I love him. These youngsters are following in that tradition and that’s great. Then there are those kids who jump on those synthesizers and they can hit one note and do a whole orchestration. Boyd: That’s bad for all the musicians who have worked hard to perfect their instrument. And here is this thing that can replace them but the real fact is, live music (a la Jazz) is the best. It cannot be replaced. Dayvs: Yeah, that is the promoting factor for my show. One of my dissatisfactions with the world of entertainment is, you have to be so commercial to be seen and there is just tons and tons of musicians out there who are just talented to the bone, who will never have an opportunity to hit the major leagues of music, television, etc. because they don’t have a hit record or because the music they are playing is not going to draw the masses. On some movies there are some good sound tracks. I’d like to see the media like MTV or VH1, get some jazz music on the air. They are on the air because they are making money, so it seems to me they could take an attitude, like a public service kind of attitude, I mean without looking for remuneration. The Arsenio Hall show would be nice, if just once, I mean once a week, he would bring someone on like a James Moody. Boyd: Every time I watch the Arsenio Hall show, there is a rapper on, no Jazz, just rap. Dayvs: I have nothing against rap music, in fact I love rap music. I think it’s probably purest art form since Jazz in my opinion. Boyd: Well, I am beginning to change my views on it after listening to it more closely. I can’t hear what they are saying. I really have to tune myself in and see what they are about. There is a message in their music, but you have to listen carefully to get the point. Dayvs: Yeah, there is something pure, energetic and very artistic about rap music. 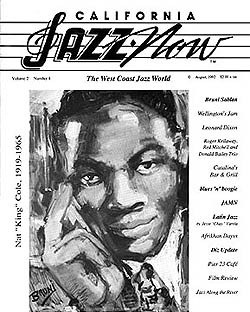 I think it’s great and has a very large audiene but there is still not enough interest out there for Jazz and why can’t we have some of that on television also, that’s what my show is all about. Getting it on the air waves on a local scale and, unfortunately, most of the stuff the record companies send me, I call light Jazz. Boyd: That was a nice tape you showed me and I wish more people were able to see it. Dayvs: What you saw, I think, was the first televised organ summit with some of the masters. I had a total of seven. And of the seven, three were major, Jimmy Mc Griff, Merle Saunders and Joe De Francisco. That’s what my show is all about, getting it on the airwaves. James Harrell McGriff will celebrate his sixtieth birthday on April 3, 1996. He was five years old when an old upright piano in the house caught his attention. His father, a musician himself, encouraged his son to play, thinking Jimmy might be a second-generation piano player. Jimmy’s uncle played bass. Jimmy also has a brother who plays drums and a sister who sings, and his grandfather played the trombone. Music was indeed around that household. Several years later, at the age of eight, Jimmy received his first instrument, a set of drums. Not a toy set, it was the real deal, and to quote Jimmy, “I could never do anything with them.” When Jimmy still could not find the pocket after a few months, his parents decided that was enough for them. They chose his next instrument, the violin, and got him lessons. And how did you like that, Jimmy? “I hated it,” was Jimmy’s response. His violin teacher also played piano and noticed that Jimmy was more interested in the piano. She mentioned this to his parents, and they said, “OK, let’s give that a try.” Well, that didn’t work because her method of teaching was boring. Jimmy could play what she played but didn’t want to be bothered with learning to read the notes. He played by ear. Somewhere in that time frame a saxophone was also purchased. That didn’t fly too well, either. Jimmy’s uncle, who was a merchant marine, came home. He’s the one who plays bass. Well, Jimmy gave that a shot, too. The only problem was that his hands were too small and the bass was bigger and taller than he was. Jimmy was telling his teacher about this thing he couldn’t remember the name of, and it happened that her brother, who played the cello, was there listening to Jimmy, and so Jimmy added the cello to the list of instruments he wanted no part of. His fingers were red and swollen from that encounter. While recovering from that experience, he thought the vibes were a fun-looking instrument, but they didn’t do it for him either. This all took place over a four-year period. Jimmy was now twelve years old. He was becoming frustrated because he knew he wanted to play, but he couldn’t do what he saw his father and uncle do. That had a positive effect on him. He became more determined to learn. Jimmy did finally settle on the upright bass, but there was still something missing. There are moments in our lives when something occurs that changes our direction and destiny. 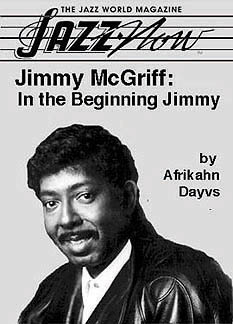 For Jimmy McGriff it was meeting Richard “Groove” Holmes. Jimmy’s uncle took him to Camden, New Jersey, to see Groove at a club named Spider Kelly’s. That’s when Jimmy discovered what was missing. Groove was about eighteen years old at the time. He played the piano with an electronic attachment called an organ. It didn’t have that Hammond B-3 sound, but it was enough for Jimmy. Jimmy called Groove and told him, “I want to learn how to play the organ.” Groove invited him to show up at his gigs and sit with him and watch and learn. Watching Groove Holmes run a bass line was the beginning of a friendship that would last until Groove died. Richard “Groove” Holmes is the one who taught and tutored Jimmy McGriff, not Jimmy Smith as has been reported erroneously for so many years. The other organist who influenced him was Shirley Scott. While in the army he was not practicing his ax but being an armed forces policeman, which was the beginning of his first career, law enforcement. After being discharged from the army, Jimmy enrolled in the Pennsylvania Institute of Criminology. Upon completion, he became a state trooper with a gun strapped to his hip and a motorcycle to ride. He went about enforcing the law by day and playing the bass by night. His major gigs on bass were with Carmen McRae in Chicago. He was recommended by Sonny Stitt, a friend of the family, and he was the backup bass player for Big Maybelle. Her bass player had a good friend named Jack Daniels, who at times insisted that he not show up. This was around 1955 at Pep’s Show Bar in Philly. Times were lean for bass players there because Philadelphia was known for organ players. There were Trudy Pitts, Shirley Scott, Jimmy Smith, and Groove Holmes, just to name a few. Jimmy had known for years that he wanted to play the organ, and with the organ you got two musicians for the price of one. You see, the organ players played the bass in the organ, and if you love that organ sound, you know there’s nothing like that bass-line groove of a Hammond B-3 organ. Jimmy and Groove got back in touch. Groove told Jimmy, “If you really want to learn how to play you need to buy an organ.” So Jimmy and Groove took a short ride to Trenton, New Jersey, where Jimmy purchased his first Hammond B-3 organ with two Leslie speakers. The year was 1956. The McGriff household was very religious, and that meant if you played music there it better be gospel. So there was no practicing at home for Jimmy. He would go to Groove’s house or they would meet at Archie Shepp’s house, which was where Jimmy kept his organ until Archie’s mom said it had to go. Several things took place over the next six months. Jimmy took to the organ like a fish to water. His new commander didn’t appreciate him calling in sick to play a gig. That ended his career as a state trooper, but not before he tagged Miles Davis with a parking ticket. Jimmy started his new career as a professional musician. In 1958 he recorded his first single for White Rock Records. “Foxy Do” was the title. But it was never released. Jimmy had a quartet that included Charlie Earland. At that time Earland played sax, but he was inspired and tutored by Jimmy and has been playing and recording on the Hammond B-3 for years. In 1961 Jimmy recorded his second single, “I Got a Woman.” You know, the one Ray Charles did. That was on a label called Jell Records. What happened after that is history. Sue Records bought Jell Records, and Jimmy released his first album, entitled I Got a Woman. It sold over a million copies. He never received his gold album, but adoring fans, thirty-five years of recording studios, forty years as a professional musician, and ninety albums recorded, not to mention all the worldwide travel, have given him much satisfaction. Jimmy McGriff has an unmistakable sound, heavy on the blues, with tinges of gospel and a bebop approach. He has worked with Count Basie, Buddy Rich, Junior Parker, Duke Ellington, Kenny Burrell, Mel Lewis, Thad Jones, and Sonny Stitt. He co-leads his quartet with Hank Crawford, a match made in heaven. Jimmy’s years as a bass player are evident in his mastery of the Hammond B-3: he keeps your toe tapping all night long. If you can find Jimmy McGriff Live at the Apollo, don’t hesitate to get it and listen to “Framed for the Blues.” There is a bass solo that will knock you out. Jimmy’s left hand and foot are working. He is the one and only king of the blues organ. Happy birthday to you! Don’t stop the music.